Having rabbits as pets throughout my life, I understand how difficult it can be to find suitable boarding that meets all your bunny needs. So I decided to provide owners with a comfortable, caring and secure environment for their pets to enable them to have their own carefree break. Each luxury lodge has its own large secure run, offering bunnies the freedom of complete exercise all day, to come and go as they please. Each bunny is locked into their lodge of a night. Bunnies do not mix with other boarders. We ask you to bring in your own dry bunny food to prevent upset tummies. Fresh hay, vegetables ,fruit are provided unless stated by yourself. Fresh water is checked throughout the day. We reserve the right to refuse any bunny that shows any signs of illness. Vaccination certificates for vhd1, vhd2 and myxomatosis are required prior to boarding. Vaccinations are required at least 3 weeks prior to boarding. If your bunny becomes ill during their stay we will inform yourself if possible and consult our own vet. Cost of any treatment will be paid by yourself direct to the vet. A non - refundable deposit of £20 is required at time of booking, which is offset from final account. Lodges will only be reserved upon receipt of deposit. Full balance to be paid on day of arrival. Deposits are not refunded in the event of any cancellation. Our two rabbits have just had a 9 night stay at The Sandling Burrows and I'm very happy with the care they received there. One is blind and Tracey took the time to ensure he was able to settle/locate food etc. and messaged me to assure us both were ok and happy. They were certainly very relaxed when we went to collect them. I have already booked their next stay. We left our two bunnies here for eight days, and were somewhat anxious as they had never been away from their home during our holidays. But we need not have worried, as both bunnies came back relaxed, healthy and showing all the signs of having been treated with kindness and love. The lodgings are clean, secure and dry. Each bunny or bunnies have their own place, and owners get to stipulate feeding time, and what they are to eat etc. We have no hesitation whatsoever in awarding five stars. Highly recommended. This is lovely accommodation for bunnies. Tracey clearly spent time with our rabbits and got to know their individual personalities. They came home happy and even more confident in exploring our flat! Absolutely fantastic bunny accommodation. I will be booking again for sure. 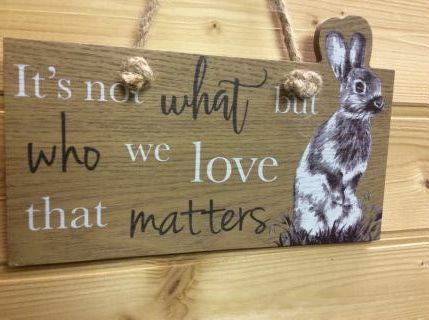 All the lodges provide a safe, clean and fun environment for all sizes of rabbits, with toys available and lots of space. Peanut was very relaxed and obviously made himself at home during his stay! We left our pet rabbit, Plopsy , with the owners over the Easter break. Very happy with the location, as it was on our way to our hotel. We were also very pleased with Plopsy's accommodation, as she had plenty of room to run/jump around. Very friendly family who took care of our rabbit. She came back happy and healthy and was clearly well looked after. Very clean and well run. We will certainly be using them again in the summer as we know she will be in safe hands.